Oh, mighty fall.... Leaves are turning red, temperature is dropping steadily, the sun goes down earlier every evening. Soon we will be hearing fireplace cracklings, smelling the beef stews and seeing people on the streets carrying dozens of wrapped gifts... And whisk(e)y events..! There are whisk(e)y events all over in the fall and The Scotch Malt Whisky Society of America is bringing 20th Annual Single Malt & Scotch Whisky Extravaganza to seven cities this year. The tour takes the start tonight in Chicago. I will be attending the one in Boston November 21st and you should definitely be checking the schedule from the poster below to find out the nearest stop to your location. I have to say these events are some of the best. 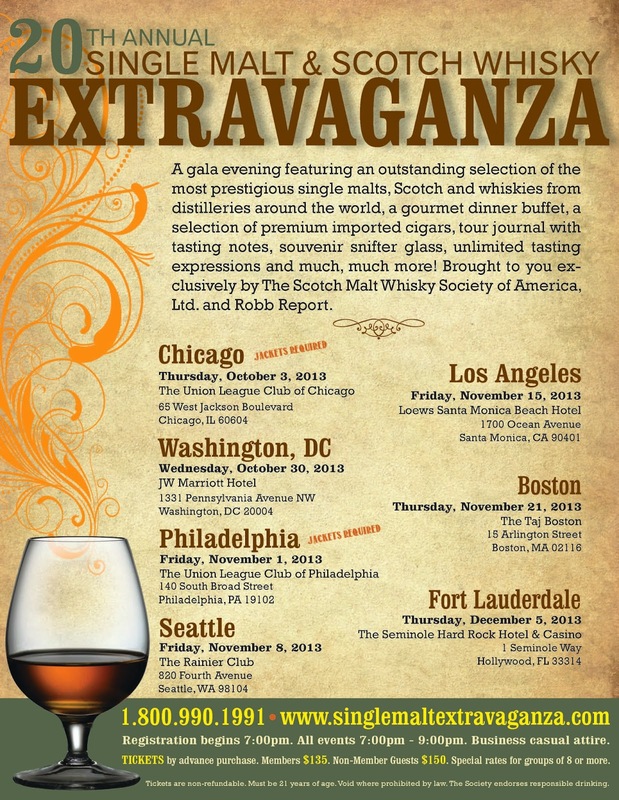 It is a chic, not rushed and cozy event with rare and exceptional single malt, Scotch and world whisky bottlings. The evening will include a yummy dinner and a selection of premium cigars for later enjoyment. They say: "The Single Malt & Scotch Whisky Extravaganza brings the discerning enthusiast the opportunity to sample the participating whiskies in a sophisticated and elegant environment with genuine camaraderie and knowledgeable representatives from each participating distillery." I say: "Sounds awesome..!"